Unfortunately 2015 was not a great year for tech IPOs--in fact it was the worst year since the Financial Crisis, with only 28 technology companies entering the US public markets. Have things changed since July 2015, when we last crunched the numbers? In this post, we analyze the 11 (that’s right, just 11) information technology companies that have gone public in the US since July 2015. Average time to IPO remains unchanged. This cohort of companies took 11.4 years on average since inception to go public, which is almost the same with our previous analysis. However, high variability comes with this much smaller sample group: it took the youngest company, Square, six years to go public; whereas for First Data Corporation it took 26 years. Company and offering sizes were similar as well. On average, the LTM revenue of these companies was $1.06B, with a net profit margin of -6%. Their average gross offering was $413 million, 2.2 times of companies that went public between January 2013 and June 2015. However, taking out the largest offering from First Data ($2.6B gross offering), then the average drops to $198M, similar to our previous analysis. Without First Data, the group’s average revenue becomes $388M, very close to the previous group. Seven of the eleven companies analyzed have fundraising data in CrunchBase, and they’ve raised on average $212M in equity funding before going public. 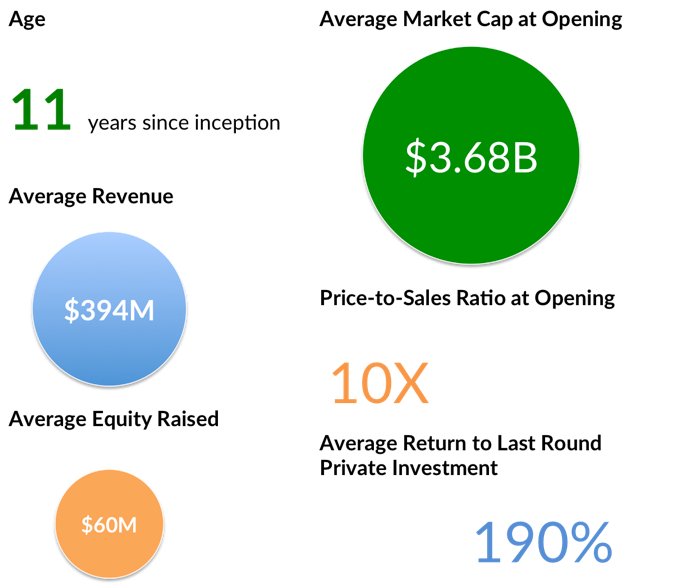 The average last round before IPO was $75M, slightly higher than the $63M in our previous analysis. So what do these tell us? A typical tech company at IPO looks pretty much the same in the past three years. So, Have These Newcomers Returned Similar Rewards to Investors? Similar to our previous analysis, most companies in this period managed to return between 0-1x premium back to their last private round investors (based on 8 companies in this set that have reported private round pricings). Two smaller companies, Mimecast and Adesto Technologies were able to return 4x- 5x premiums, whereas Square went through a much discussed down-round. The average premium of these companies was 1.25x, much lower than the previous 1.90x. Arguably, IPO price correction has begun. These newly minted public companies expectably have high volatilities in stock prices. Unfortunately, they haven’t been able to beat the market, or the overall tech sector yet. As shown in the chart below, since Jan 4, 2016, overall S&P, S&P Information Technology, and Nasdaq- 100 Technology Sector Indices all have went up slightly between 1.7% to 2.7% as of April 12, whereas the newcomers’ prices dropped by almost 13% weighted by market cap. And where are these companies trading at now? On average a 4.18x price-to-sales ratio. It is higher than S&P 500’s 1.8x and Nasdaq’s 3.1x, but much shy of that of Facebook, Google, and Microsoft. Although based on a much smaller sample size, a typical tech company at its IPO still looks pretty much the same, and private investors are still able to get positive returns in most scenarios. However, the market has become much more conscious over these newly public tech companies, as the premium between offer price to last private round pricing is shrinking, the stock prices are highly volatile and suffering negative returns, and the price-to-sales ratios are humble in comparison with tech elephants. These data points confirm what we've observed anecdotally-- public markets, despite recent recovery, remain jittery about tech IPOs, and it is likely that the first few tech companies to make the leap may have to go public in an "IPO down round". We believe the current market conditions present risks, but also bring opportunities. Private shareholders may consider liquidating to avoid a longer hold-up, whereas investors may be able to extract more value through investing in pre-IPO stocks now. Please refer to “The Pre-IPO Investment Opportunity in a Down Market” and “A Down Market: When Liquidity Matters” for our previous detailed analyses. Data sourced from 11 technology companies that executed an initial public offering from July 2015 until March 2016 in the US (two Chinese companies also went public in the US in this period, but are excluded due to lack of data). Data retrieved from Capital IQ, company S-1s, and Yahoo Finance. Past performance is not indicative of future returns, and this is not an investment recommendation. Links to outside sources do not constitute an approval or endorsement of the content on those websites.